Across America, most public transportation agencies are facing conflicting pressures: while ridership is declining, new regulations and pressure from the public are pushing for the adoption of cleaner buses to reduce air pollution and greenhouse gas emissions. Depending on how they respond to these pressures, transportation agencies can be seen as part of the air quality improvement solution, or part of the problem. The state of California is leading the way in developing sustainable public transportation based on Zero Emissions Buses (ZEB). Five key steps are behind California's leadership. In California, guidance came from the top: in 2012, Governor Jerry Brown issued an Executive Order directing the state government to help accelerate the market for zero-emission (ZE) vehicles. Beginning in 2025, Los Angeles will cease purchasing non-ZEBs, and will make major areas of the city fossil-fuel free by 2030. Concrete plans for change are essential: the California Air Resources Board (CARB) recently approved the 2030 Climate Change Scoping Plan, which targets a 40% reduction of emissions (from 2020 levels). Recognizing that transportation is a primary source of GHG emissions, the plan wants to significantly increase the use of ZE medium and heavy-duty vehicles—including buses. Because a system-wide transformation will incur costs, the California Air Resources Board funds ZE initiatives. Their Fiscal Year 2017-18 Funding Plan for Clean Transportation Incentives includes the Hybrid and Zero-Emission Truck and Bus Voucher Incentive Project (HVIP), which provides rebates for low-emission trucks and buses, with the largest rebates for ZE vehicles. $35 million in HVIP funding is designated for ZE transit buses. An additional $180 million was added for the fiscal year 2017-18, for Clean Truck and Bus Vouchers (the HVIP program plus Low NOx Engine Incentives). This includes a specific $300,000 voucher for Fuel Cell Electric Buses longer than 40 feet, with an additional $15,000 of funds for disadvantaged communities (DAC) or low-income census tracts. Such vouchers will bring the price of fuel cell electric buses at parity with diesel hybrid buses. Infrastructure is also supported: a $100,000 per-bus grant is available for the installation of a hydrogen refueling station. While some states and districts take a wait-and-see attitude, California’s transit agencies are already electrifying their fleets. Seven agencies representing over 3,400 buses (approximately 25% of all buses in the state) have committed to fully electrifying their fleets. 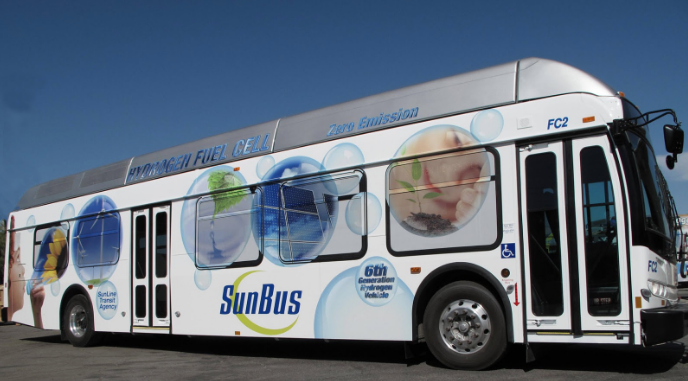 Some of these, including AC Transit, Orange County Transit Authority and Sunline Transit, have already embraced and deployed zero-emission Fuel Cell Electric Buses. 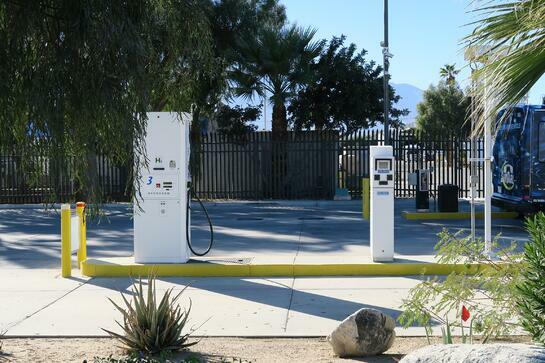 The California government is committed to financially supporting the large-scale buildout of a hydrogen fueling infrastructure. Half of the planned refueling stations are now fully operational, and the rest are in various stages of development. The infrastructure is designed for a future of growth: the hydrogen filling stations at transit depots are built to be scalable (similar to CNG filling stations), with capacity that can grow from 10 to 100 buses, simply by upgrading the compression and storage equipment and adding dispensers. Other states and regions need only look to California for sustainable transportation strategies that can be implemented if the political will is there. ZE bus fleets, including Fuel Cell Electric Buses, are a reality. The opportunity is clear: any transit agency can make the switch, and they can be seen as part of the solution—not part of the problem.